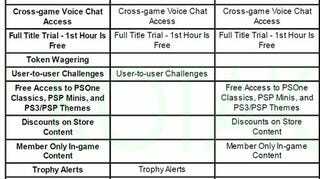 A survey sent from IPSOS Online Research indicates that Sony is considering premium subscription plans for the PlayStation Network, detailing potential prices and premium services, including full hour game trials, free access to PSOne Classics, and cross-game voice chat. Sony is considering offering a premium PlayStation Network subscription in the future. The subscription offering would provide new premium features you could choose to pay for and are in addition to the features currently available for free such as access to online multiplayer gaming (current features would remain free). Following the introduction is a series of definitions of terms such as Token Wagering - a set number of tokens given to subscribers per month that can be used to be on games and exchanged for PSN content - and Cloud Storage Space for Games, which would allow players to save their game online rather than on their hard disk, protecting their data. Other notable services listed as potential premiums include loyalty reward programs, automatic updates, member-exclusive Facebook Connectivity, an online music service and music video service, Hulu TV catch-ups, member-only game content, discounts, demo-sharing (sharing exclusive member-only demos from your full games with friends), and Netflix without a disc. By far the most attractive premiums are full title trials, which give the user one hour access to full PlayStation 3 games, and free access to PSOne Classics, PSP minis, and premium themes. The list also indicates that some eagerly awaited features could be subscriber only, such as cross-game voice chat. Having waited so long for the feature, I doubt fans would be particularly happy to have to pay for it. The chart below details four potential plans, with three costing $69.99 a year or $9.99 a month - more than an Xbox Live Gold subscription, and one running $4.99 a month and $29.99 a year. We've contacted Sony for comment on the survey, but have yet to hear back as of press time. Just keep in mind that companies regularly test the waters by sending out questionnaires like these, and they by no means represent any concrete plans on Sony's behalf. It seems as if they simply want to gauge customer reaction to the various plans and features. Your reactions, please?